Enteric fever is a major public health problem in India. Salmonella enterica (S. enterica) is motile, non-lactose fermenting, non-spore forming, and Gram-negative rod shape bacterium. It can ferment glucose with production of acid and gas. The subspecies of enterica are three serotypes such as paratyphi A, B, and C that cause paratyphoid fever . The important virulence factor of Salmonella paratyphi A (S. paratyphi A) is cytolysin A i.e. a cytotoxic protein which form pores in the cell membrane . Salmonellae mainly causes infection through contaminated food or drink to the gut first through this protein then enter into bloodstream. After that, it can infect to other parts of the body. Manifestation of clinical symptoms such as diarrhoea and rashes from paratyphoid fever usually occur between 6-30 days after being infected . S. enterica serovar paratyphi A, B, or C are estimated to cause 5.5 million cases of enteric fever each year . In the United States, paratyphoid fever is uncommon, while, an estimated 5.4 million outbreaks occur in East Asia in 2000 . Fluoroquinolone derivatives like ciprofloxacin, nalidixic acid etc. are extensively used to combat paratyphoid fever in most parts of world. In East Asian countries like India the prevalence of this disease is too high. In India, newer cephalosporins derivatives, azithromycin, chloramphenicol and ofloxacin are mostly prescribed against paratyphoid fever, due to development of resistance towards ciprofloxacin and nalidixic acid [6-8]. The patients with paratyphoid fever especially in immunocompromised cases have a high rate of relapse. Due to nature of this phenomena a short course treatment with either fluoroquinolones or newer cephalosporins derivatives are ineffective. There are not much data available in this area to provide satisfactory treatment recommendations. Antibiotics are used to kill the bacteria, but with increasing rates of antibiotic resistance, this treatment is becoming less effective. Delay in receiving appropriate antibiotic treatment may have serious consequences that lead to high rates of mortality . Therefore, some alternative strategies are needed to treat against strains of S. paratyphi A.
Harold Saton Burr, had performed the detailed studies on the correlation of electric current with physiological process and concluded that every single process in the human body had an electrical significance . Recently, it was discovered that all the electrical process happening in body have strong relationship with magnetic field as described by Ampere’s law, which states that the moving charge produces magnetic fields in surrounding space [11,12]. According to Rivera-Ruiz et al. reported that electrocardiography has been extensively used to measure the biofield of human body . Thus, human has the ability to harness the energy from environment or universe and can transmit into any living or nonliving object(s) around the Globe. The objects always receive the energy and responding into useful way that is called biofield energy and the process is known as biofield treatment. Mr. Trivedi’s unique biofield treatment is also known as The Trivedi Effect®. Mr. Mahendra Trivedi’s biofield treatment has been known to transform the structural, physical and thermal properties of several metals in material science [14-16], improved the overall productivity of crops [17,18], altered characteristics features of microbes [19-21] and improved growth and anatomical characteristics of various medicinal plants [22,23]. Due to the clinical significance of this organism and literature reports on biofield treatment as an alternative approach, the present work was undertaken to evaluate the impact of biofield treatment on S. paratyphi A in relation to antimicrobials susceptibility, minimum inhibitory concentration (MIC) and biotyping based on various biochemical characters. S. paratyphi A, American Type Culture Collection (ATCC 9150) strains were procured from MicroBioLogics, Inc., USA, in two sets A and B. Two different sealed packs were stored with proper storage conditions until further use. The antimicrobial susceptibility, MIC values, biochemical reactions and biotype number were estimated with the help of MicroScan Walk-Away® (Dade Behring Inc., West Sacramento, CA, USA) using negative breakpoint combo 30 (NBPC 30) panel with respect to control sample. All the tested antimicrobials and biochemicals were procured from Sigma-Aldrich (MA, USA). Two ATCC samples A (revived) and B (lyophilized) of S. paratyphi A were grouped (Gr.). The revived sample A was divided into two parts Gr.I (control) and Gr.II (revived; treatment); likewise, ATCC B was labeled as Gr.III (lyophilized; treatment). Gr. I remained as untreated. The treatment Gr. II and III in sealed pack were handed over to Mr. Trivedi for biofield treatment under laboratory condition. Mr. Trivedi provided the treatment through his energy transmission process to the treatment groups without touching the samples. After treatment, all samples were handed over in the same condition and stored for analysis. Gr.II was assessed at two time point i.e. on day 5 and 10 and Gr. III was assessed on day 10. After biofield treatment, all the groups (control and treated) were investigated for antimicrobial susceptibility, MIC, biochemical reactions pattern and biotyping. Investigation of antimicrobial susceptibility of S. paratyphi A was carried out with the help of automated instrument, MicroScan Walk-Away® using NBPC 30 panel. The panel can be stored at 2°C-25°C for analysis. The panel was allowed to equilibrate to room temperature prior to rehydration. All opened panel was used within the same day. The tests carried out on MicroScan were miniaturized of the broth dilution susceptibility test that has been dehydrated. Briefly, the 0.1 ml (100 μl) of the standardized suspension of S. paratyphi A was pipetted into 25 ml of inoculum water using pluronic and inverted 8-10 times and inoculated, rehydrated, and then subjected to incubation for 16 hours at 35°C. Rehydration and inoculation was performed using the RENOK® system with inoculators-D (B1013-4). 25 ml of standardized inoculum suspension was poured in to inoculum tray. The detailed experimental procedures and conditions were followed as per the manufacturer's instructions. The antimicrobial susceptibility pattern (S: Susceptible, R: Resistant; and I: Intermediate) and MIC values were determined by observing the lowest antimicrobial concentration showing inhibition of growth . Biochemical activities of S. paratyphi A was determined using MicroScan Walk-Away®, system with NBPC 30 panel. Preparation of NBPC 30 panel, inoculum followed by dehydration and rehydration were performed similar way as mentioned in antimicrobial susceptibility assay for analysis of biochemical reaction followed by biotype number. The detailed experimental procedures and conditions were followed as per the manufacturer's instructions [24,25]. The biotype number of S. paratyphi A was determined on MicroScan Walk-Away® processed panel data report with the help of biochemical reactions data. [24,26]. The outcome of S. paratyphi A susceptibility pattern and MIC values of tested antimicrobials after biofield treatment are summarized in Tables 1 and 2 respectively. The data were analyzed and compared with respect to control. Antimicrobial sensitivity was carried out in twenty antimicrobials. The revived treated cells (Gr. II) of S. paratyphi A showed a significant (60%) alteration (twelve out of twenty) in antimicrobial sensitivity pattern on day 10 while did not show any alteration on day 5 as well as in Gr. III as compared to control. Antimicrobials such as amoxicillin/k-clavulanate, ampicillin/sulbactam, aztreonam, chloramphenicol, piperacillin, tetracycline and ticarcillin/k-clavulanate showed alteration of susceptibility pattern from S to I in Gr. II on day 10 as compared to control. Moreover, antimicrobial agents such as ampicillin, ceftazidime, ceftriaxone, ciprofloxacin and trimethoprim/sulfamethoxazole showed alteration of sensitivity pattern from S to R in Gr. II on day 10 as compared to control after biofield treatment. 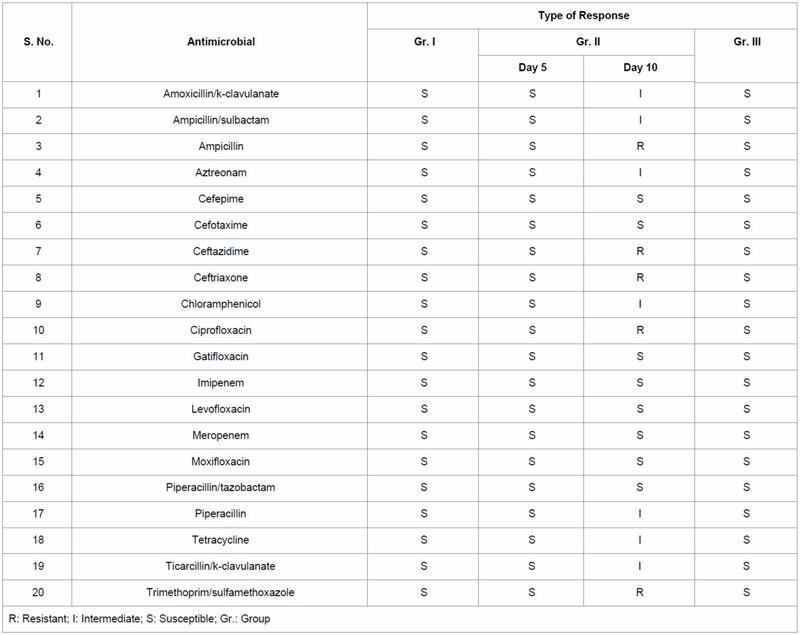 Eight out of twenty (40%) antimicrobials did not show any change of antimicrobial sensitivity after biofield treatment with respect to control sample (Table 1). The MIC values of amoxicillin/k-clavulanate and ampicillin/sulbactam were changed from ≤ 8/4 µg/ml to 16/8 µg/ml in Gr. II on day 10. Moreover, MIC values of ampicillin and ceftazidime were also changed from ≤ 8 µg/ml to >16 µg/ml) in Gr. II on day 10 as compared to control. Alteration of MIC values (≤ 8 µg/ml to 16 µg/ml) were noticed in revived treated samples of certain antimicrobials like aztreonam, cefoxitin, and chloramphenicol except cefuroxime were changed from ≤ 4 µg/ml to 16 µg/ml on day 10. Moreover, change in MIC values (≤ 4 µg/ml to 8 µg/ml) were observed in Gr. II in case of norfloxacin, tetracycline and tobramycin on day 10 after biofield treatment. Antimicrobials showed an alteration of MIC value (≤ 8 µg/ml to >32 µg/ml) in case of ceftriaxone, (≤ 1 µg/ml to >2 µg/ml) in case of ciprofloxacin, (≤ 16 µg/ml to 64 µg/ml) in case of piperacillin and ticarcillin/k-clavulanate, (≤ 2/38 µg/ml to >2/38 µg/ml) in case of trimethoprim/sulfamethoxazole on day 10 in Gr. II. Besides this, ESBL-b Scrn showed an alteration of MIC value (≤ 1 to >1 µg/ml) in Gr. II on day 10. Overall, 53.12% (seventeen out of thirty two) MIC values were altered after biofield treatment as compared to control. 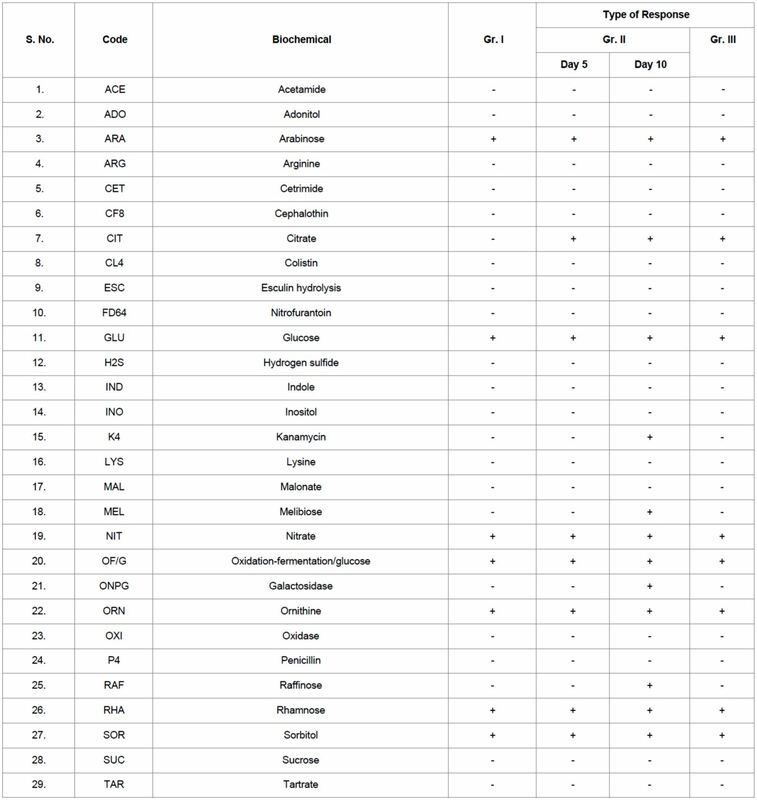 Fifteen, out of thirty two tested antimicrobials (46.88%) did not show any alteration of MIC values in treated cells of S. paratyphi A as compared to control (Table 2). Overall, the antimicrobial resistance pattern (S to I/R) and corresponding MIC values were significantly altered in revived strain S. paratyphi A after biofield treatment as compared to control. In this experiment, ciprofloxacin and cefotaxime were sensitive to control S. paratyphi A (Gr. 1) and the MIC value was slight increase in ciprofloxacin (≤ 1 µg/ml to >2 µg/ml) while, it did not alter in case of cefotaxime in Gr.II on day 10. This finding is supported by literature data . Table 1: Antibiogram of Salmonella paratyphi A: effect of biofield treatment on antimicrobial susceptibility. Study of biochemical reactions can be utilized to identify the enzymatic and metabolic characteristics feature of microbes. Microorganisms can be categorically differentiated based on their utilization of specific biochemicals as nutrients during the process of metabolism or enzymatic reactions. The specific biochemicals showed some changes against S. paratyphi A after biofield treatment as shown in Table 3. Biochemicals such as melibiose, galactosidase, raffinose, tobramycin and kanamycin were changed from negative (-) to positive (+) reaction in Gr. II (on day 10) but remained same i.e. negative (-) in Gr. II (on day 5) and in lyophilized treated cells (on day 10) with respective to control. According to Latif et al. positive reaction (+) of galactosidase is the characteristics feature of citrobacter species , which positively correlated with change of biotype number and identification of the same organism in this experiment after biofield treatment. Citrate converted from negative (-) to positive (+) reaction in all the treated groups with respect to control in biofield treated S. paratyphi A cells. Overall, 18.18% biochemical reactions were altered in tested thirty three biochemicals with respect to control after biofield treatment. In revived treated strain of S. paratyphi A cells showed alteration of biochemical reactions as 18.18% on day 10 and 3.03% on day 5, as compared to control. The lyophilized treated cells (Gr. III) of S. paratyphi A showed only 3.03% alteration of biochemical reaction as compared to control. About 81.82% of total tested biochemicals, such as acetamide, adonitol, arabinose, arginine, cetrimide, cephalothin, colistin, esculin hydrolysis, nitrofurantoin, glucose, hydrogen sulfide, indole, inositol, lysin, malonate, nitrate, oxidation-fermentation, ornithine, oxidase, penicillin, rhamnose, sorbitol, sucrose, tartrate, tryptophan deaminase, urea and Voges-Proskauer did not show any change in all treated groups after biofield treatment as compared to control. Table 3: Effect of biofield treatment on Salmonella paratyphi A to the biochemical reaction pattern. Based on existing literature Salmonella serovers are able to ferment the five basic sugars by producing both acid and gas. However, differentiation of specific Salmonella serotype on the basis of their sugar fermentation pattern is difficult. The key characteristic feature for Salmonella paratyphi A bacterium is non-lactose fermenting, but it can ferment glucose with production of acid and gas . In this experiment, control sample of S. paratyphi A resulted positive (+) reaction in glucose and sorbitol and negative reaction (-) in case of sucrose. These biochemical results supported from literature data Buxton and Fraser , Hossain , and Han et al. . These findings could be due to fermentation of glucose and produce acid and gas which supports the characteristics feature of S. paratyphi A. Negative reaction (-) of indole of Salmonella paratyphi A in control sample was found due to split of tryptophan form indole. Negative reaction (-) was also observed in Voges-Proskauer biochemical of control sample. The negative responses of indole and Voges-Proskauer were directly correlated that the microbe was Gram-negative rod shaped and belongs to Enterobacteriaceae family, these findings also supports the statement of Latif et al. . The species (S. paratyphi A) was identified based on variety of conventional biochemical characters and biotyping. 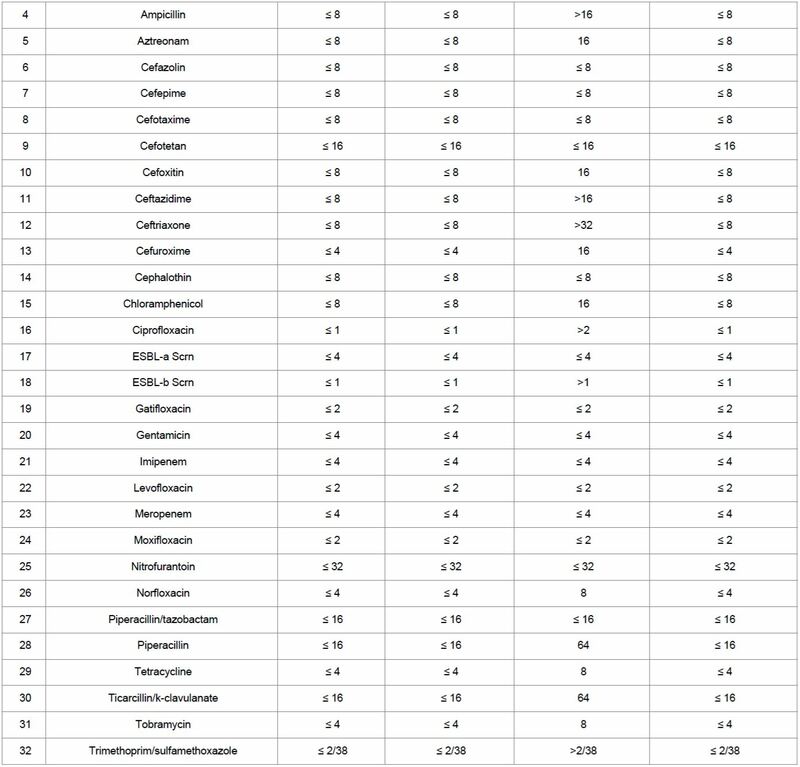 Biotype number of particular organism was evaluated after interpreting the results of the biochemical reactions. Further, the biotype number led to the particular organism identification. In this experiment, biotyping was performed using automated systems, and results found significant changes in the biofield treated Gr. II (on day 5 and 10) and Gr. III (on day 10). Based on the biochemical results, biotype number was changed in treated Gr. II on day 5 (53001040, S. paratyphi A), on day 10 (57101050, Citrobacter freundii complex) and Gr. III on day 10 (53001040, S. paratyphi A) with respect to control (53001000) i.e. S. paratyphi A (Table 4). In revived treated cells the change of biotype number with organism i.e. Citrobacter freundii complex was possibly due to positive reaction (+) of ONPG after biofield treatment as compared to control. These findings are supported by the statement of Latif et al. . This change of organism is assumed due to metabolic or enzymatic reaction of S. paratyphi A. For further confirmation, a detailed study is required on genetic level. Table 4: Effect of biofield treatment on biotype number of Salmonella paratyphi A. Due to microbial resistance to a single or multiple drugs, invention of an effective antimicrobial therapy for the human-wellness is urgently required. However, due to some limitation of science, the progress of new medications is slow and very challenging for scientists. Mr. Trivedi has the ability to harness energy from environment and altered the significant changes in microorganisms [19-21]. Mr. Trivedi’s biofield treatment on various strains of clinical isolates  and multi drug resistance (MDR) [19,21] have recently reported a significant results. Biofield treatment might be responsible to do alteration in microorganism at genetic level and/or enzymatic level, which may act on receptor protein. While altering receptor protein, ligand-receptor/protein interactions may altered that could lead to show different phenotypic characteristics . Biofield treatment might induce significant changes in revived strain of S. paratyphi A and altered antimicrobials susceptibility pattern, MIC values, biochemical reactions, and ultimately change the biotype number. Based on these results, we hope that, biofield treatment has the ability to alter the sensitivity pattern of antimicrobials. Altogether, the biofield treatment has significantly altered the susceptibility pattern (60%) with MIC values (53.12%) of tested antimicrobials against the strain of S. paratyphi A in revived treated cells (Gr. II) as compared to control. It also altered the biochemical reactions pattern (18.18%) and biotype number of biofield treated strain of S. paratyphi A in Gr. II as compared to control. On the basis of changed biotype number after biofield treatment, new organism was identified in Gr. II as Citrobacter freundii complex (57101050) with respect to control i.e. S. paratyphi A (53001000). Mr. Trivedi’s biofield treatment could be applied as alternative therapeutic approach to alter the sensitivity pattern of antimicrobials. 1. Umeh E, Agbulu C (2009) Distribution pattern of salmonella typhoidal serotypes in Benue State Central, Nigeria. Internet J Epidemiol 8: 1-6. 2. Oscarsson J, Westermark M, Löfdahl S, Olsen B, Palmgren H, et al. (2002) Characterization of a pore-forming cytotoxin expressed by Salmonella enterica serovars typhi and paratyphi A. Infect Immun 70: 5759-5769. 3. Bhan MK, Bahl R, Bhatnagar S (2005) Typhoid and paratyphoid fever. Lancet 366: 749-762. 4. Maskey AP, Day JN, Phung PQ, Thwaites GE, Campbell JI, et al. (2006) Salmonella enterica serovar paratyphi A and S. enterica serovar typhi cause indistinguishable clinical syndromes in Kathmandu, Nepal. Clin Infect Dis 42: 1247-1253. 5. Gupta SK, Medalla F, Omondi MW, Whichard JM, Fields PI, et al. (2008) Laboratory-based surveillance of paratyphoid fever in the United States: travel and antimicrobial resistance. Clin Infect Dis 46: 1656-1663. 6. Ohnishi K, Murata M (1990) Treatment of Salmonella paratyphi A infection with oral ofloxacin. Jpn J Med 29: 436-437. 7. Soe GB, Overturf GD (1987) Treatment of typhoid fever and other systemic salmonelloses with cefotaxime, ceftriaxone, cefoperazone, and other newer cephalosporins. Rev Infect Dis 9: 719-736. 8. White NJ, Dung NM, Vinh H, Bethell D, Hien TT (1996) Fluoroquinolone antibiotics in children with multidrug resistant typhoid. Lancet 348: 547. 9. Bhutta ZA (1996) Impact of age and drug resistance on mortality in typhoid fever. Arch Dis Child 75: 214-217. 10. Burr HS (1957) Bibliography of Harold Saxton Burr. Yale J Biol Med 30: 163-167. 11. Hammerschlag R, Jain S, Baldwin AL, Gronowicz G, Lutgendorf SK, et al. (2012) Biofield research: a roundtable discussion of scientific and methodological issues. J Altern Complement Med 18: 1081-1086. 14. Trivedi MK, Tallapragada RM (2008) A transcendental to changing metal powder characteristics. Met Powder Rep 63: 22-28. 31. 16. Trivedi MK, Patil S, Tallapragada RM (2015) Effect of biofield treatment on the physical and thermal characteristics of aluminium powders. Ind Eng Manage 4: 151. 18. Lenssen AW (2013) Biofield and fungicide seed treatment influences on soybean productivity, seed quality and weed community. Agricultural Journal 83: 138-143. 21. Trivedi MK, Patil S, Shettigar H, Gangwar M, Jana S (2015) An effect of biofield treatment on Multidrug-resistant Burkholderia cepacia: A multihost pathogen. J Trop Dis 3: 167. 22. Patil SA, Nayak GB, Barve SS, Tembe RP, Khan RR (2012) Impact of biofield treatment on growth and anatomical characteristics of Pogostemon cablin (Benth). Biotechnology 11: 154-162. 25. Nesa MK, Khan MSR, Alam M (2011) Isolation, identification and characterization of salmonella serovars from diarrhoeic stool samples of human. Bangl J Vet Med 9: 85-93. 26. Torre E de la, Tello M, Mateu EM, Torre E (2005) Use of biochemical kinetic data to determine strain relatedness among Salmonella enterica subsp. enterica isolates. J Clin Microbiol 43: 5419-5424. 27. Gupta V, Kaur J, Chander J (2009) An increase in enteric fever cases due to Salmonella Paratyphi A in & around Chandigarh. Indian J Med Res 129: 95-98. 28. Latif M, Gilani M, Usman J, Munir T, Mushtaq M (2014) Lactose fermenting Salmonella Paratyphi A: A case report 30. J Microbiol Infect Dis 4: 30-32. 29. Buxton A (1977) Animal Microbiology. Blackwell Scientific Publications, Oxford, UK. 30. Hossain KM (2002) Characterization of bacteria isolated from diarrhoeic calves. MS Thesis, Department of Microbiology and Hygiene, Bangladesh Agricultural University, Mymensingh. 31. Han J, David DE, Deck J, Lynne AM, Kaldhone P, et al. (2011) Comparison of Salmonella enterica serovar Heidelberg isolates from human patients with those from animal and food sources. J Clin Microbiol 49: 1130-1133.